All Bracelets are .925 Sterling Silver and can be special ordered in youth and children sizes. As they grow, you can return your bracelet to us and we can add extra links! Small Edelweiss Bracelet, complete with an acorn and oak leaf charm, all in .925 Sterling Silver. 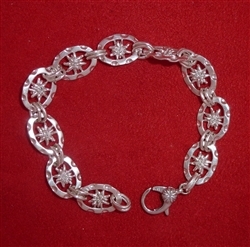 Small Double Sided Edelweiss Bracelet in .925 Sterling Silver. Medium Edelweiss Bracelet, complete with an acorn and oak leaf charm, all in .925 Sterling Silver. Edelweiss Bracelet with alternating large and small links, complete with an acorn and oak leaf charm, all in .925 Sterling Silver. Large Link Edelweiss Bracelet with an acorn and oak leaf charm, all in .925 Sterling Silver. 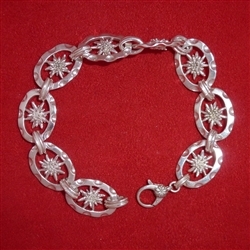 Large Double Sided Link Edelweiss Bracelet, in .925 Sterling Silver.